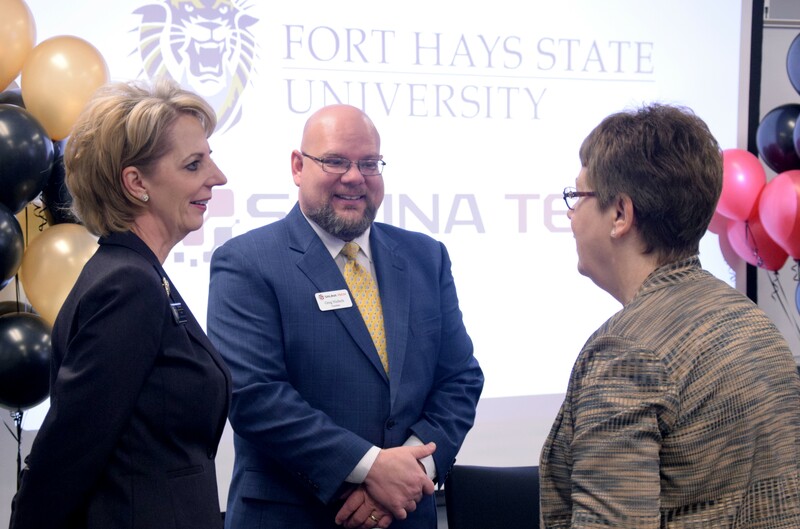 HAYS, Kan. – The presidents of Fort Hays State University and Salina Area Technical College came together Tuesday morning in Salina to sign an agreement making it easier and more affordable for people across North Central Kansas to earn a bachelor’s degree. “This opens the door for folks in Salina and the surrounding communities, or anywhere in the state, really, to take credits here and transfer those credits to Fort Hays State University to work toward their goal of higher education,” said Salina Tech President Greg Nichols at the signing ceremony. These new agreements mean students can earn an Associate of Applied Science through Salina Tech, and then Fort Hays State will accept all of those credits towards a bachelor’s degree from the university. General studies: Students can take up to 45 hours of General Education courses at Salina Tech, such as English Composition I and II, College Algebra and World History – before transferring to Fort Hays State to earn a Bachelor of General Studies degree. Criminal justice: Students will be able to earn an associate degree in Salina Tech’s new Police Science program, which also accepts credits from the Kansas Highway Patrol Academy and the Kansas Law Enforcement Training Center, and then transfer to Fort Hays State to earn a Bachelor of Science in criminal justice. Health studies: Students who earn an Associate of Applied Science in one of Salina Tech’s health care programs, such as Dental Assistant or Medical Assistant, will be able to transfer to Fort Hays State to earn a Bachelor of Science in health studies. Technology Leadership: Students who earn an Associate of Applied Science in any of Salina Tech’s technical programs, such as Auto Collision Repair, Machine Tool Technology, Welding or any of the college’s health care fields, will be able to transfer to Fort Hays State to earn a Bachelor of Science in Technology Leadership with a concentration in career and technical education or business and industry. Whatever pathway students choose, they will have the support of both institutions, including academic advising, the advantage of the low tuition rates offered by both institutions and the convenience of taking many of their classes online. For more information, contact Salina Area Technical College, 785-309-3100. Cutline: Fort Hays State University President Tisa Mason, left, and Salina Area Technical College President Greg Nichols talk to Becky Claus, director of nursing at Salina Tech.